You are a trusted member of the community, and you can use your certification credentials on your business card, LinkedIn profile, website, and other collateral. You can use the Ethical NDA in all your business dealings. The Ethical NDA is a two-way, mutual agreement that is much more than a conventional NDA. You will learn more about it during the certification process, but it is a fully automated NDA-type document that you can implement as easy as forwarding an email to the person you wish to sign the agreement with. The certification process is merely to take the Ethical Collaboration Certification video course, which should take about 1 1/2 hours to complete. It is a video-delivered training course that covers a ton of issues that you may or may not have known about intellectual property. The course is focused on IP issues for startup companies, and especially items that many entrepreneurs overlook. For service providers, the Ethical Collaboration Certification shows that you are a trusted member of the community and that you pledge to protect your client’s IP. For startup companies, the Ethical Collaboration Certification educates the entire team about IP issues, and gives you the Ethical NDA tool that you can use with all your customers, suppliers, consultants, advisors, mentors, and other people. 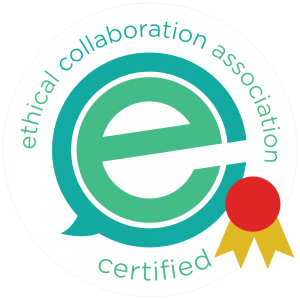 For mentors and advisors, the Ethical Collaboration Certification means that you will do no harm to the companies you advise, but also that you support fair and ethical business practices. Take the FREE Certification course. Sign the Ethical Collaboration Community Agreement. Official Certified Ethical Collaboration stickers for your laptop. The respect of your peers. A year’s subscription to the Ethical NDA, which is a version of the Ethical Collaboration Agreement. The Ethical NDA can be used in all your business relationships. The Ethical NDA is a fully automated NDA system, where you can send a link to whoever you want to do an NDA with. They will fill out the form, and both of you will sign a legally binding agreement using DocuSign. You can find out more about the Ethical NDA here.